Displaying the RCMP SAFE PLACE symbol at your premise carries some important responsibilities that will greatly assist in protecting Lesbian, Gay, Bisexual, Transgender, Queer/Questioning (LGBTQ) victims of crime. 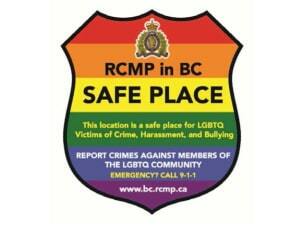 Please apply the RCMP SAFE PLACE decal outside the front entrance of your establishment, building, room, etc. (approx. 3-5 feet high, if possible). If there is no glass at your front entrance, the RCMP SAFE PLACE poster can be placed conspicuously inside your premise. Please either call, or assist these victims in calling 911. Click the image below to learn more about the SAFE PLACE program and how you can participate today!